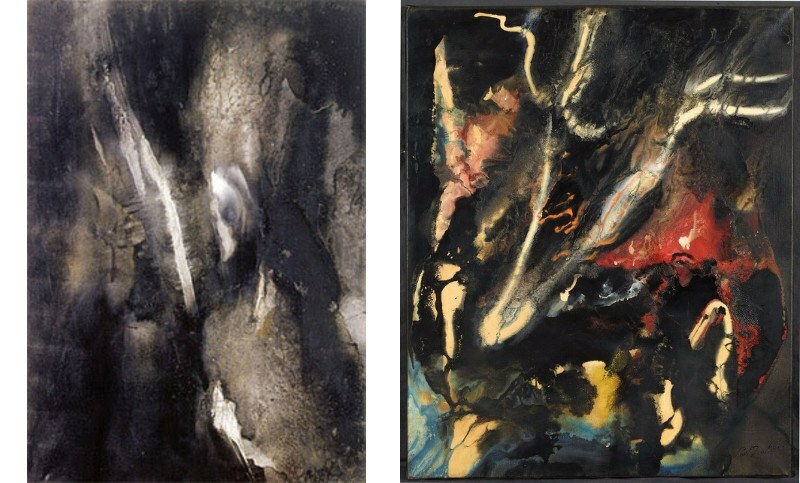 Paul Jenkins was a prolific American abstract artist, known for his unusual chance-based, paint-pouring and fate-tempting technique of painting. He is considered as one of the most important figures of New York’s Abstract Expressionism, alongside Jackson Pollock and Willem de Kooning. Paul Jenkins was born in 1923 in Kansas City, Missouri. As a teenager, he moved to Youngstown, Ohio. As a boy, Jenkins met both Thomas Hart Benton, an American regionalist painter, and Frank Lloyd Wright, a distinguished architect. Fire that occurred in a city where his great uncle was pastor destroyed a local church, and Frank Lloyd Wright was in charge for building a new one. Accordingly, the young Jenkins met Lloyd Wright, who recommended him to drop art and take up farming. Ironically, many years later Jenkins’ art was exhibited in one of the most famous buildings that Wright designed, the Guggenheim Museum in New York. Jenkins’ talent for art developed through his various interests in visual arts, as well in theater. Jenkins earned a fellowship to the Cleveland Playhouse, and later he went to the Drama School of the Carnegie Institute of Technology in Pittsburgh. From 1938 to 1941, Jenkins served an apprenticeship in a ceramics factory at Kansas City Art Institute. He spent weekends there, watching the skillful handling of clay by the masters’ hands. Paul was impressed how they guided shapes and forms with ease, and this observation later had a profound effect on his ideas about approach to canvas and painting. In the following years, Paul Jenkins served in the United States Maritime Service and the US Naval Corps. After his return, he moved to New York in 1948, joining a wave of aspiring painters moving to the Big Apple. Determined to become an artist, Jenkins enrolled into the Art Students League, where he studied under the mentorship of Yasuo Kuniyoshi and Morris Kantor. During the course of his studying, Paul was drawn to several artists, including Jackson Pollock’s captivating dynamics and the metaphysical approach of Mark Tobey. 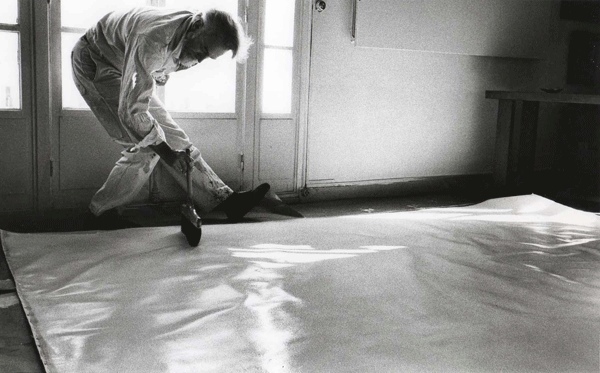 He became associated with the Abstract Expressionists as he met Pollock himself, and befriended artists such as Jean Dubuffet, Mark Rothko, and Willem de Kooning. In a search of different perspectives and influences, Jenkins traveled to Sicily, then Spain, and later to France, which in time became a second home for the rest of his life. Although he resettled in Paris in 1953, Paul’s lifelong connection with New York never quite faded. 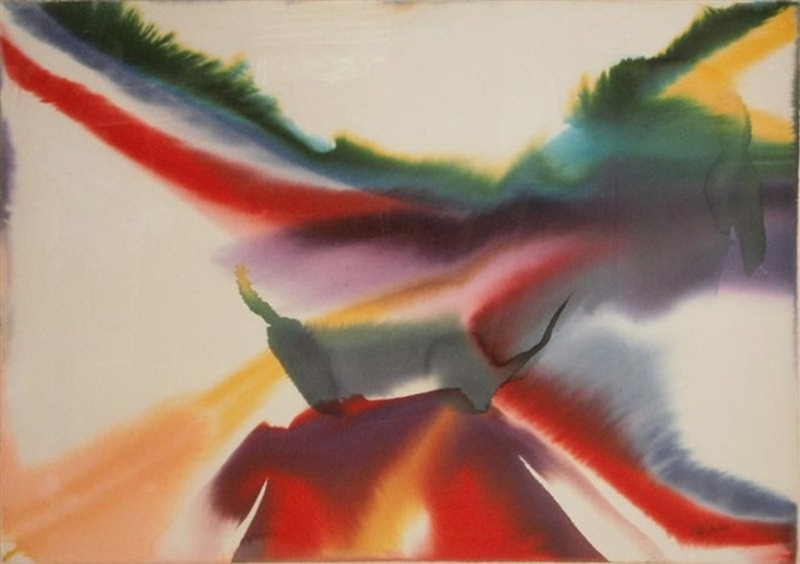 In 1977, Paul Jenkins met the photographer, art historian and future wife Suzanne Donnelly. At that time, she was working on an archive material that later became their joint book titled Anatomy of a Cloud. Extensive and highly detailed, the book consisted of 24 tomes, and was published in 1983 by Harry N Abrams. At a peak of his career in the 1970s and 1980s, Jenkins lived a rather glamorous life between his homes in Paris and New York. His works graced a high-fashioned Pierre Cardin boutique in Paris. At one time, the first lady of France Danielle Mitterrand visited his Parisian studio, and Paul decided to throw a party for her, with guests like Paloma Picasso, Robert Motherwell and Berenice Abbott. Paul Jenkins was very interested in Eastern religions and Jungian philosophy. He was especially drawn to the I Chang, an ancient divination text and the oldest of the Chinese classics, and to the writings of Carl Gustav Jung. These writings had a great influence to aesthetics and artistic approach of Jenkins, highlighted with the artist’s step towards self-reflection and psychoanalysis in his later years. He was also interested in astrology and mysticism – his Upper East Side house was filled with prisms, oriental objects, stones, rocks and found objects that to him were irresistible. His other homes included the one in Paris, and also in St. Paul de Vence, near Nice. The St. Paul de Vence home was actually an industrial building which the artist converted into a studio. 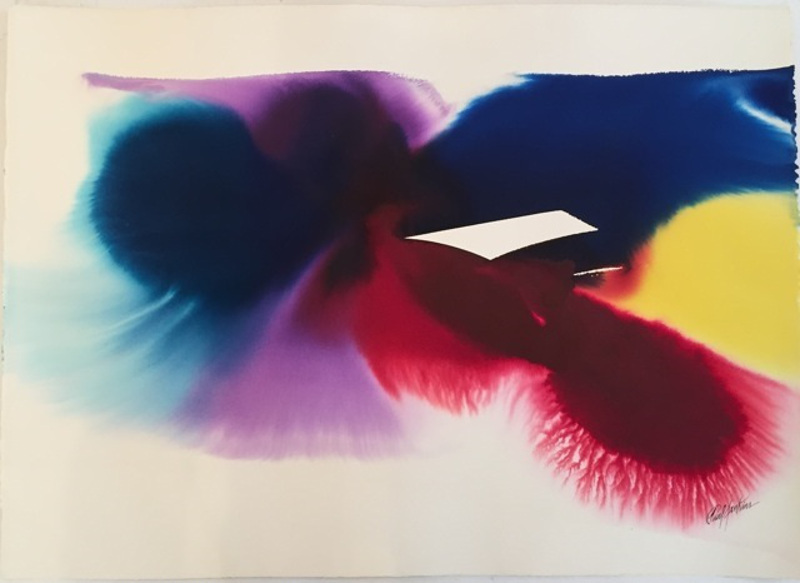 Paul Jenkins’ work is for the technique and location closely associated with New York’s abstract expressionism, although it resembles more closely to Morris Louis’ and Helen Frankenthaler’s visual style. During his stays in France, Jenkins got familiar with the works of Odilon Redon, a 19th century French symbolist painter. Paul was primarily impressed by Redon’s wildly colored and frenetic backgrounds that seem abstract for the context. As for him, Paul used to describe himself as an “abstract phenomenist”. In 1959, the artist began to entitle all of his artworks with a preface word Phenomena, followed by a key phrase or word that would not allude to any visual form. 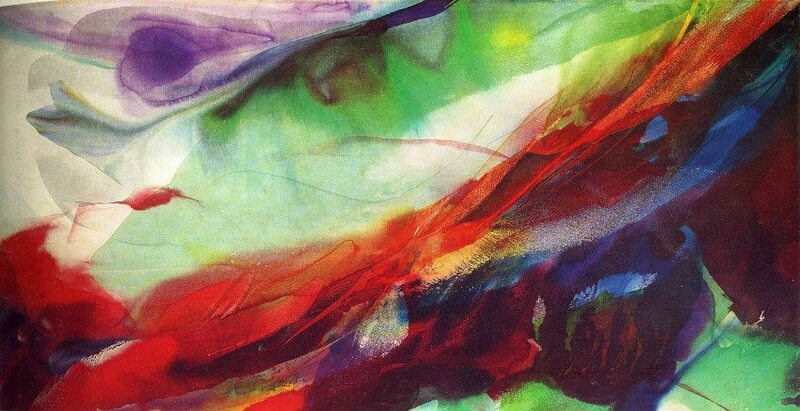 Paul Jenkins’ paintings are filled with energy, dynamics and life. Like some force of nature, they light up a space they complement, giving it a special atmosphere and motion. Colors are vivid and playful, vague or unmixed, creating a multi-layered impression of a canvas. Ranging from indigo and aquamarine to bright yellow and orange, with burst of dark blue and deep green, colors capture the swift disappearance of changing light. First ever one-man exhibition of Paul Jenkins’ works was held in Paris in 1954, at the Studio Paul Facchetti. His first US exhibition followed two years later, which took place at the Martha Jackson Gallery in New York. Soon, more than eighty-five museums located in more than 10 countries followed their example. Since the 1950s, international exhibitions of Jenkins’ works never stopped and continued throughout all of his career, including several significant major retrospectives at the Kestner-Gesellschaft, Hanover, the Palais des Beaux-Arts, Charleroi, Museum of Fine Arts, Housto, San Francisco Museum of Art, and the Musée Picasso in Antibes. The organized major retrospectives gave Jenkins’ more exposure in 1970s. In the same decade, in 1978, his works appeared in Paul Mazursky’s movie titled An Unmarried Woman. The paintings had a starring role as the works done by a main protagonist of the movie, a Manhattan artist played by the actor Alan Bates. 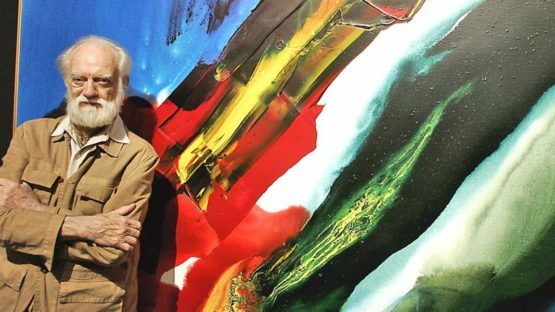 Paul Jenkins’s art caught an eye of many collectors throughout the United States and Europe. Nevertheless, the artist had a stronger following in Europe, who with his flowing white hair and beard reminisced of an old-fashioned archetype of the avant-garde artist. The Europeans and especially French art figures loved it. Jenkins’ abstractions are included in numerous private and museum collections worldwide, such as the Museum of Modern Art – MoMA in New York, the Guggenheim Museum in New York, the Whitney Museum of American Art, Tate Museum in London, National Museum of American Art, Stedelijk Museum in Amsterdam and Centre Georges Pompidou in Paris, among many others. Paul Jenkins continued to paint to his death in 2012, in his Manhattan home. The artist died at the age of 88, after a short illness.